Campaigners gathered on Centurion Way on Saturday evening to experience the dark skies of the South Downs National Park. The Dark Skies Festival, which ended on Sunday, inspired the Friends of Centurion Way to gather for hot soup and hot chocolate near the amphitheatre as the sun set. Constellations Cassiopeia, The Great Bear and Orion were clearly in view. The southern part of the path is threatened by homes and the campaign’s next step is to organise a site visit with the White House Farm consultants, council members and John Grimshaw, who helped build it. The next event will be on Easter Saturday, March 31 from 2pm to 4pm, when an Easter quiz will be organised at the beginning of the path near the bridge over the railway. There will be a fancy dress parade and families are encouraged to come in their best Easter outfit or Easter bonnet. 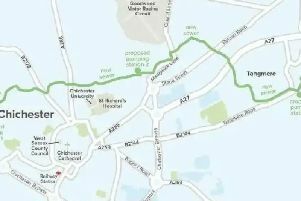 Anyone who would like to join the Friends of Centurion Way or find out more about the campaign to preserve and enhance the path for all users, please email contact@centurionway.org.uk or phone Sarah Sharp on 07789 843556.